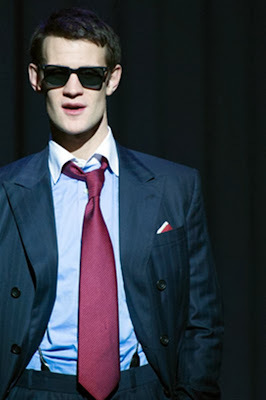 Trading sonic screwdriver for shotgun, Matt Smith sheds his Dr Who persona to emerge as Patrick Bateman the damaged anti-hero of American Psycho. A bestselling and sometimes darkly comic comment upon the vacuity of the 1980's, Brett Easton Ellis’ novel was famously realised as a 2000 movie starring Christian Bale. 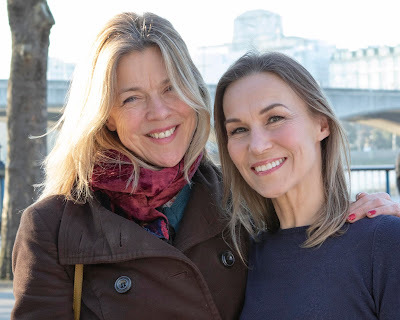 Since then a musical version has been talked of, but it has taken until now for Rupert Goold to helm the first ever translation of an Ellis novel from page to stage. A young and talented investment banker, Bateman is devoted to style and success, finding failure nauseating. His psyche however is complex and being surrounded by chatteringly beautiful Vogue-devoted peers, (the women in particular have a clever early ensemble number You Are What You Wear) whose pursuit of fashion or the next major deal leaves him cold, only deepens his frustrations as his actions become increasingly barbaric. Smith represents perhaps the most inspired casting of recent years. Where the eponymous Doctor is at best semi-detached from society, Bateman’s mind is truly a world apart from his surroundings and when it comes to detachment, nobody does it better than Smith. His antic disposition early on sets him apart from his banker buddies and as his reason ebbs away, Smith perfectly captures Bateman's mental decline, never once losing focus nor resorting to cliche. His signature number Clean is a clinically chilling performance from an actor not usually associated with melody. The company work is classy and consistent. Susannah Fielding is Evelyn, Bateman's fiancée, more focused on the carat count of her engagement ring than the slowly crumbling cognisance of her betrothed. Goold has given her a persona more often associated with a Roy Lichtenstein pop art painting. Fielding's characterisation is one of the most fleshed out depictions of a shallow two dimensional woman to be found. Cassandra Compton’s Jean, whose love for Bateman touches the very heart of the beast, has us fearing for her safety whilst gasping at her performance as during her assured solo of A Girl Before, Bateman seductively undresses her, all the time his nail gun close at hand. Amongst the men Hugh Skinner’s closeted gay Luis who mistakes a murderous grip from the homophobic Bateman as a sign of affection, delivers a recurring vulnerability that is never offered cheaply. Seasoned trouper Gillian Kirkpatrick, playing Bateman’s mother, suggests just a whiff of Hitchcock’s Mrs Bates as we seek to comprehend the complex motivation of her son. Roberto Aguirre-Sacasa’s book takes a scalpel to Ellis' original, fashioning a carefully crafted arc that is original yet also true to source. Aguirre-Sacasa's background is in comic book creativity (his is the Vegas-bound Spider-Man: Turn off the Dark) and his eye for the graphic makes for a seamless interpretation. With music and lyrics by Spring Awakening's Duncan Sheik, the 1980’s pedigree of the show is assured. Sheik's songs are consistently concise and on point. No trite lyrics here, Bateman himself would be proud. Es Devlin uses the compact Almeida space effectively, enhancing the minimalist set with two inspired revolves on stage left and right that stylishly shift the action from Manhattan’s high society to a Hamptons beachfront with Finn Ross’ video projections completing the illusions. The story’s violence, mostly suggested and only once depicted with extreme gore, is tastefully portrayed with Lynne Page’s choreography brilliantly depicting the (blood-free) shotgun blastings of a deranged nightclub massacre. Whilst the story may not be timeless, some thirty years on and amidst London’s multi-million pound properties, chic eateries and an ever widening gulf between rich and poor, much of the ethos that Ellis despised lives on today. But much as Bateman takes an axe to his victims, so too will this show split critics and opinions. Not for children, nor the easily offended, American Psycho is shocking and uncomfortable theatre. Brutally inspired, brilliantly realised and stunningly performed. In one of those episodes of life imitating art, with the run already sold out and until this show transfers to the West End (which it surely must), you are more likely to score a table at New York’s fictional Dorsia restaurant than at the Almeida. Day tickets are available until the show closes February 1, details below. Queue early and wrap up warm.